Week two of the Utilitaire 12. Already? Yes, already, so if you’re thinking about jumping in on the fun, now’s the perfect time! Alexandria-based Rootchopper needed a haircut, and he took the scenic route. Read about it at his post Utilitaire Gone Wild. D.C.’s Pedal ‘n Purl went to the National Building Museum to take in an evening lecture about architecture. John, of the D.C. blog Porta-John, attended a community meeting with several other D.C.-area cyclists at Friday Coffee Club. Annapolis, Maryland-area commuter and randonneur Mike, aka Chesapeake Sailor, pedaled to his local bike shop, transporting a bike wheel on his back. Nice vest! Also, on a non-utilitaire note, Mike and a few friends rode a memorable 200K permanent out of Rockville, Maryland, this past weekend. Cold, rain, darkness, and snow. All the winter fun you want in a ride! Shebicycles, of Tennessee, spent an active day on the Surly Long Haul Trucker/Xtracycle that included picking up some axe handles at the hardware store. I don’t think I’ll ever do a utilitaire that involves axe handles. Austin-based cyclist, An Old Guy on Two Wheels, fetched a book from the library and took his Big Dummy to Lowe’s this past week. D.C. blogger Bicycle Bug completed his first utilitaire by riding to work. In the dark! Berlin by Bike purchased some literature at the bookstore. Bike-centric literature. Extra credit! 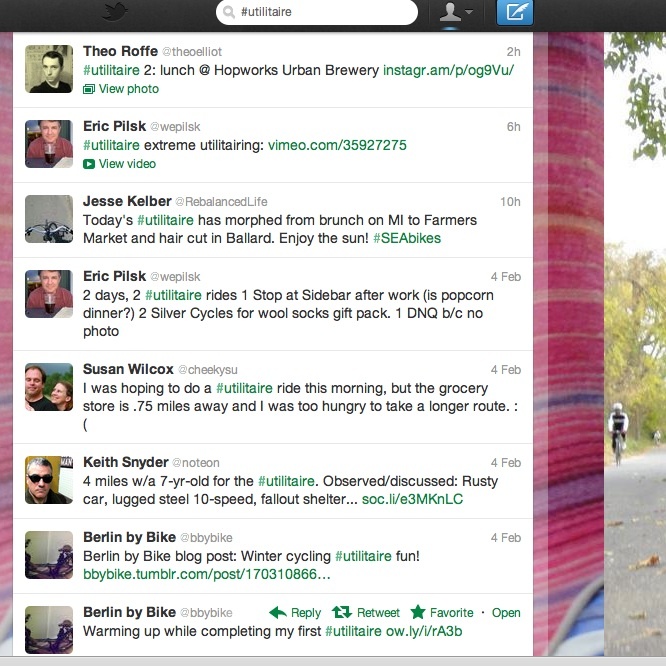 The #utilitaire tweeps have also been active. @tangobiker in Portland, Oregon, is somehow finding time to work in utilitaires in between coffeeneuring and winter permanents. Not satisfied with completing the Coffeeneuring Challenging, I believe he is attempting the first Coffeeneur 52 ever! @theoelliot, also of Portland, utilitaired to what looks like a delicious lunch at a local brewery. Yum! @RebalancedLife of Seattle utilitaired to brunch and then, a haircut. @wepilsk picked up some wool “utilitaire socks” at his local bike shop in Maryland. He also went out and ate popcorn for dinner one evening, but forgot to document it. Oops! @SognRider, of #CyclingCapTuesday fame, elected a substitution, and rode to his wife’s work to help her carry some things home. So nice! Thanks to everybody for sharing their diverse utilitaires. Did I miss you? If so, please let me know. I want to hear about what you’re doing! I’m off. Time to get ready for the morning utilitaire to the office. 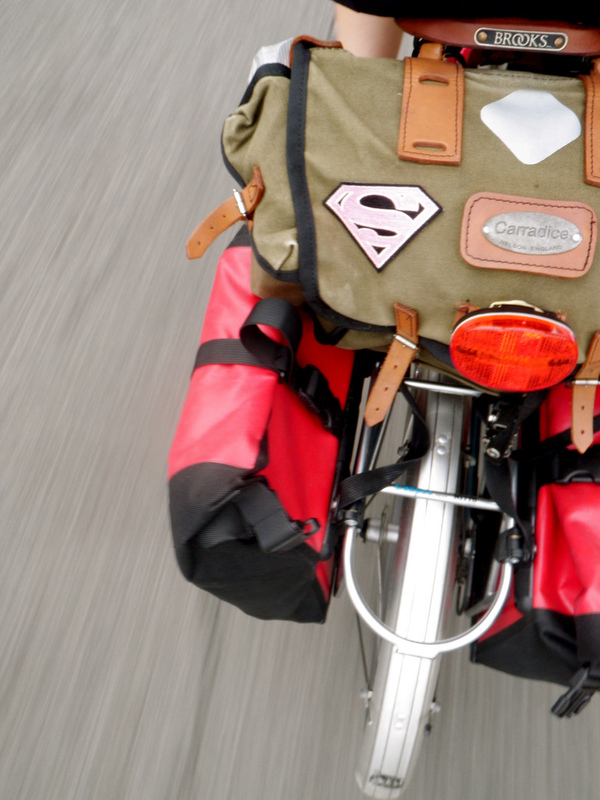 Yes, the Carradice (this is the Pendle) works perfectly w/ a rack and panniers.